Last blog post was about the natural treatments and methods I use with my bees. But treatments and methods pale in comparison to the need of good breeding stock (this holds true of any livestock operation). To make a hive work well, in my humble opinion, it is best to have queens bred from naturally treated or treatment free stock, that are adapted to the environment they will face. I like dark bees. Northwest Washington state is cold and rainy. Dark bees tend to do better here. They fly earlier and later in the day and in the year. They’ll even fly in a light rain. They over winter on fewer stores. They slow down reproduction when food is scarce, the weather’s bad and when it’s winter (a combination of both issues here). I likeRussians (Primosky), New World Carniolan, Survivor Stock, and Hybrids that are bred to do well in this area. Using resistant and/or locally adapted queens is almost the most important part of my operation. I have raised some of my own queens for years. Plus I spent a year working for another beekeeper who had thought about raising local stock as a business plan. Queen rearing is a whole other blog post. But, in short, I have had success using a “vertical” Hopkins method, (the link goes to a great traditional, horizontal Hopkins explaination from Ohio Homestead) and the JPIN method (just put it in). The latter is taking a frame of eggs and larva and putting it in the top of a Cloake Board cell builder. I have grafted,used removeable plugs (there’s Jenter, Nicot, a EZI and probably more : this link is EZI), and used the Alley method. I am now trying a very cool cell punch tool, which I acquired at the end of last season from Carriage House (the last link). I’ve yet to try the Miller method, but I will one day. I like to experiment. It’s fun. I do purchase some queens every year. I tend to try different suppliers until I’m happy with the results. At the moment I like Strachan Queens : New World Carniolan with some Caucasian genetics (Sue Colby’s line of queens) and Northwest Queens : Hybrids from a very diligent and exacting Puget Sound queen breeder. I am hoping to get some Kirk Webster queens for the first time in 2013. I do not requeen, unless the queen is failing. My new queens usually go to work in nucs. The bees know far more about their queen needs and queen selection than I do. Even if you only have a few hives you can raise queens. The two biggest obstacles are 1) having enough bees for the starter/finisher and 2) where the drones they mate with will originate. Easiest way around this is to be part of a bee keeping group; formal or informal. For enough bees: Everyone can contribute frames of bees to the starter/finisher. For drones: get out a map and plot where everyone has hives. Chose the most central location (hopefully there’s an area where hives are one-quarter mile to two miles from a center hive area). That’s your queen rearing area. The surrounding hives are drone mothers. Whatever method one chooses, the most important part is to keep notes. Keeping good notes is the most important part of my operation. It does me no good to raise and/or buy queens if I don’t know how they perform and under what conditions they work. 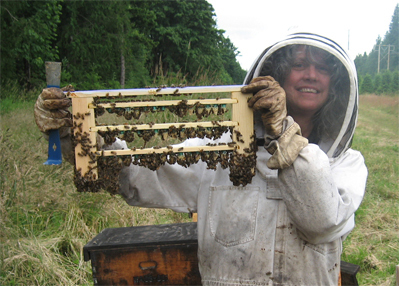 It was gratifying to see at the end of this year that my best hives have what I call “Whatcom” queens : queens bred and mated from my own hives. But even if that were not so, I would need to know which of my queens performed the best and which succumbed due to lack of forage, bad weather, pests or diseases. I do the field notes in a small notebook, then transfer it to a word document at the end of the year. This year, the final notes were 20 pages long. I keep weather and forage notes on wall calenders. Note keeping is a pain, but it tell me a lot. I only have 50 hives, on average, so it is do-able. With hundreds or thousands it would be harder, but just as necessary, one would simply adapt how to keep notes to the situation. Survival in nature is a long process of adaptation. In my humble opinion, the only way out of the current mess of pests, pathogens, and diseases, as well the ones that will come, is through adaptation. Breed from the survivors. It’s logical and every beekeeper can either do it or purchase from other beekeepers who are working towards honeybees that can survive without treatments. There, done. Bet your eyes glazed over. But that’s the news from Brookfield Farm Bees And Honey. Any ideas, notes, or suggestions on natural treatments, methods, and queen rearing are always welcome. I have learned so much from other beekeepers, be they local or from half a world away. After all, we have to keep adapting to survive. This entry was posted in Beekeeping, Queen Rearing : Honeybees and tagged Bean, beekeeper, Beekeeping, Brookfield Farm, how to, Karen, Maple Falls, methods, overview, queen, rearing, tools, Washington. Bookmark the permalink.